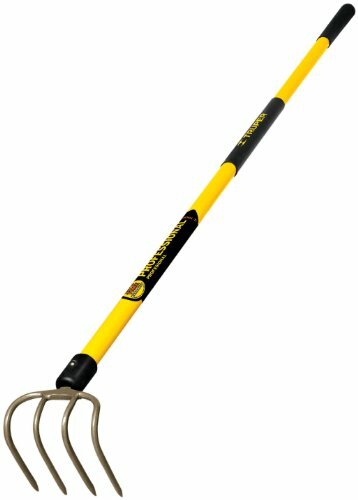 Truper 30030, CUL-F, Tru Pro 4-Tine Forged Cultivator, 5-Inch Head, Fiberglass Handle, 60-Inch. 60-inch Professional Grade fiberglass handle with soft cushion grip for balance and control. White Ash handles give optimum ratio of resistance and flexibility. 4 tine cultivator. Use on farm or ranch for a lifetime of use. Tru Pro.-inchThe Contractors Choice-inch for professional use. Truper has been in the hand tool manufacturing business for over 40 years and is by far the largest Mexican company in its field. Truper relies on the most advanced modern and efficient technology to guarantee the optimum quality and value of its products and demanding service needs of the company's global customers. Tru Pro is a premium line true to the specs of contractor-grade tools. The unit is also geared at the consumer who wishes to step up to high-end tools. Best Value at the top end of the market. Tru-Pro products features the heaviest gauge heads available, tab sockets or steel collars, along with a select choice of white ashwood handles for the optimum ratio of resistance and flexibility. Lifetime warranty backs all Tru-pro tools.